MARSHALL, TEXAS; September 16, 2016 – A jury in the United States District Court for the Eastern District of Texas has awarded Core Wireless Licensing, a subsidiary of Conversant Intellectual Property Management Inc., $2.28 million in damages after finding that LG Electronics, Inc. and its subsidiary LG Electronics Mobilecomm U.S.A., Inc. willfully infringed two smartphone patents owned by Core Wireless. The jury’s award is for past damages and is based on a $0.06 per unit royalty ($0.03 per patent). The patents-in-suit—U.S. Patent No. 7,804,850 and U.S. Patent No.6,633,536—provide innovations that improve battery life and voice quality in mobile phones. Core Wireless alleged that most of LG’s recent smartphones infringe two Core Wireless patents. The jury determined that the patents have been willfully infringed and are not invalid, and awarded Core Wireless past damages based on a reasonable royalty of $0.06 per unit, or $2.28 million. 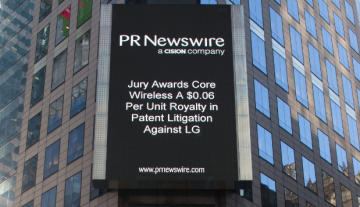 Core Wireless intends to ask United States District Judge Rodney Gilstrap to order LG to pay a $0.06 per unit running royalty on all future sales of the infringing products for the remaining life of the patents, one of which expires in 2028. Core Wireless will also request Judge Gilstrap to award enhanced damages. The case is Core Wireless Licensing S.a.r.l. v. LG Electronics Inc. et al., Civil Action No. 2:14-CV-912 (E.D.T.X. ).The infringing LG products generally are LG’s smartphones sold in the United States since September 2010. Core Wireless is represented by Russ August & Kabat, Noroozi PC, and Capshaw Derieux. About Core Wireless Core Wireless Licensing Ltd. is an intellectual property management company focused on licensing a major portfolio of wireless patents and patent applications of over 250 patent families, consisting of about 1,200 wireless patents and patent applications that cover technologies used in a wide range of mobile communications devices and services. Core Wireless is a subsidiary of Conversant Intellectual Property Management Inc.
About Conversant Conversant Intellectual Property Management Inc. is a global intellectual property management company known for its principled approach to patent licensing. 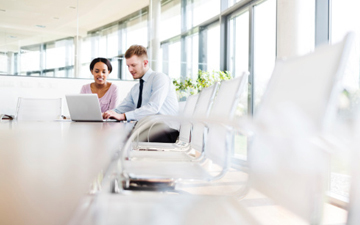 With a portfolio of thousands of patents and patent applications under management, Conversant has special expertise in semiconductors and communications technology. For more information, please visit www.conversantip.com.